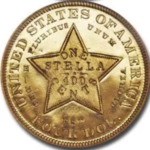 Thomas G. writes: Dear Coin Doc, I cannot find any similar coin on the web, and am not even sure which country it is from. Dated 1703, showing 3 crowns and a large C with Roman numerals Xii and laurels, the reverse is showing the date and the initials I. OR. Hz. The o has an Umlaut, and it may well be from the former Austro Hungarian Empire. I wonder which country it is from, and whether it has any value. Size is 17 mm diameter, the same as a Swiss half batz. Thanks. You have a 1703 Swedish 1 Ore (8 ore K.M.= 1 Mark). It was struck at the Stockholm Mint during the reign of King Carl (Karl) XII, ruler of Sweden from 1697 to 1718. Weighing 1.2317 grams, the one Ore coins issued from 1701 thru 1714 are alloyed with 25% silver and have an actual silver content of .0099 oz. 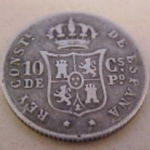 Later issues under Carl (1715-1717) saw a drop both in weight and silver content. 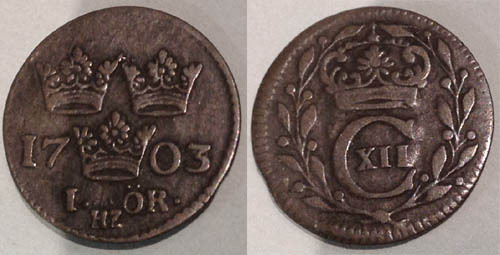 The obverse of the coin shows 3 crowns splitting the date 17 03 on each side, the denomination 1 ÖR and the initials HZ (Henrik Zedritz, Stockholm Mint administrator 1700-06) below. The reverse displays a wreath circling a crown with C XII (Carl the Twelfth) beneath. Only 345,000 1 ore coins were struck in 1703 but it is one of the more common dates in the series. 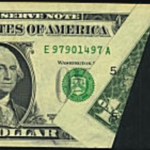 Value depends on grade (condition). 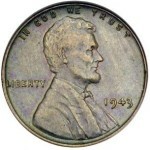 Approximate value range for your coin: US $15-$25. King Carl (Latinized to Carollus or Charles) was 15 years old when he assumed the Swedish throne. Just three years later Sweden was invaded by a group of its European neighbors, an attack encouraged by Peter the Great of Russia. This began the 21 year long Great Northern War which Sweden ultimately lost. From the beginning, Carl personally led his troops. He never again returned to Stockholm, his capital city. 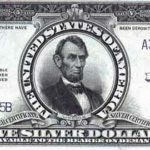 Juan Carlos of Spain TokenAmerica's First Silver Dollar?